Stop me if you’ve heard this one. What happens when you combine a monkey, a blow gun, and a ton of balloons? PURE MAGIC. Sorry, there’s no joke here; I just wanted to let you know how delighted I am by Bloons TD. I’m sure Bloons is old news for many of you, but this review is for the five or so who might not have realized that concentrated joy and delight was available at the App Store. If you’re a fan of tower defense, there’s a very high chance you’ve encountered Bloons games in the past, and there’s a good reason for that. The Bloons TD games are some of the most popular and polished tower defense games freely available on the web. The series is up to 4 now, but the app is a combination of 1 through 3 and iPhone-exclusive tracks. But don’t worry, even without 4 (my personal favorite), this app gives you a ton of bang for your buck. If you’ve never played a tower defense game, this is a great one to start with because the graphics are clean, the controls are easy to understand, and there’s plenty of wiggle room to experiment and learn. You start with a clearly defined track and a handful of cash. 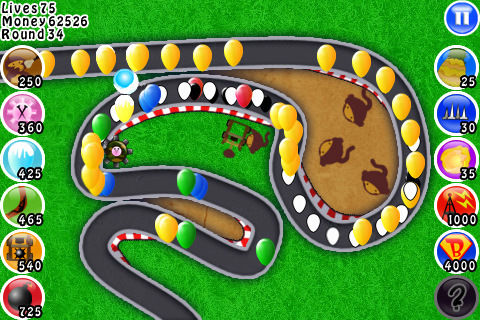 When you start a level, balloons appear at one end and start to travel down the path. The goal is to pop all the balloons before they reach the end. Simple, but how do you pop the balloons? That’s where the “towers” come in, which, in this case, can mean a number of different things, including tack shooters, freeze rays, and, of course, monkeys. You buy towers before each level and situate them along the path where you think they’ll do the most damage. All of these towers have their own strengths and weaknesses, but you can also upgrade them as the game goes on to make them more effective. Each balloon you pop and each level you complete earns you more money to buy new towers or upgrades. Pretty much all tower defense games work like this, but Bloons is special because of its overall polish and charm. Occasionally you’ll spend a little time trying to squeeze a tower into a tight space, and the button placement is a bit, er, shall we say, cozy? But the two different control schemes generally worked quite well. The bold and distinctive graphics are predictably outstanding, and I liked the jaunty music, but it does get a little repetitive after awhile, although they do thoughtfully provide you with the option of playing your own music. There are also medals to win for each different track and the game is OpenFeint enabled for easy sharing of your scores with friends. In short, Bloons TD is the gold standard of tower defense games, in addition to being one of the very best games available at the App Store. If you’re a fan, you should already have this one, and if you’re just curious, you should already have this one. This is the rare incredibly fun, replayable, and highly addictive game that will cost you hours of your time and possibly sleep, but it will still be totally worth it. AppSafari review of Bloons TD was written by Tracy Yonemoto on May 12th, 2010 and categorized under App Store, Featured, Fun, Games, Tower Defense. Page viewed 5261 times, 1 so far today. Need help on using these apps? Please read the Help Page.